This gentleman had for many years found that social occasions were difficult. 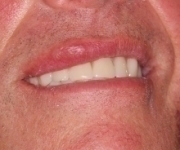 He had lost confidence in eating and speaking in social gatherings both because of the appearance of his teeth but also because his dentures tended to move or drop down when eating or speaking. 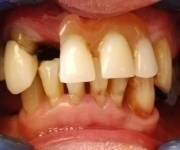 There had been loss of teeth over many years and the remaining teeth showed advanced gum disease or infection. Some of the teeth in the upper jaw at the back and sides had grown down meaning that their gum condition was poor and there was insufficient space to place a denture or opposing teeth of any description in some areas. Despite this there was still a reasonable bone stock for implant placement. The remaining teeth were removed and eight implants were placed in the upper jaw and four in the lower jaw at the same time. 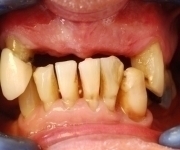 He was able to have a temporary bridge in both jaws fitted within 2 days of his surgery and final restoration at 3 months. This image is taken after fitting the temporary bridge.